I'm what most refer to as a "retro gamer." I enjoy the older games from the past generations, notably the 8-Bit (Nintendo) and 16-Bit (SNES and Genesis) generations, although the Playstation is arguably "retro" as well and I do play that on occasion and have a somewhat nostalgic tendency to it and the N64 as well. I was there with Nintendo from the beginning, first dipping my toes into their clear waters in the 1980s and through to their previous console, The Gamecube, where the waters were a little muddier but still worth swimming in. I've seen their ups, the Super Nintendo and Gameboy, Mario and Zelda, as wellas their downs such as the loss of developer support with the N64 and the release of the Virtual Boy. Then we have the Wii. 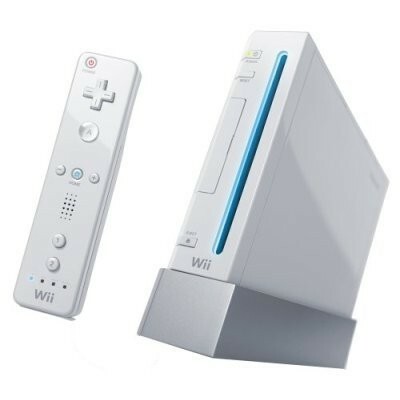 It's a little white box that plays games but is noted for being about a generation of technology behind in terms of power, using motion control with the Wii controller and having a solid lineup of classic titles available for download into its limited storage capacity. It's Nintendo, but the Wii is an odd duck, or as Geroge Gobel once said to Johnny Carson "Did you ever get the feeling that the world is a tuxedo and you're a pair of brown shoes?" Those brown shoes might be well-made, cheap and popular, but that doesn't mean they fit in with the rest of the ensemble. Like most of Nintendo's products, the Wii sells extremely well, and is their biggest success in terms of home consoles in a long while. At the same time, I look at the games on it and have to give a wry smirk. A console isn't defined by the numbers, or even the people that buy and play it, meaning I won't defend it with the high sales numbers nor criticize it because of the people, known as "casual" gamers (or people who don't play videogames but like to pick it up, like grandma). No the success of a console is defined by the games. There were highly powerful system in the past, most people didn't even know they existed because there was nothing worth playing on them. When it comes to the Wii, I can't help but glance at some of its titles and see something utterly bizarre. The only thing I can liken it to are those cheap PC stands you might see at an electronic or computer store. You know, the one with low-quality budget titles like a disc full of a dozen variations of Mahjong or Casino collections. If you look closely, you might find something great like a Doom or a Sim title, but it's mostly junk. That is what a majority of the Wii lineup is: junk. I'm not here to criticize the specs of the Wii and graphical abilities or even the motion control, I'm merely taking a look at the titles on it and, as a retro gamer even, I almost feel insulted. I don't want to just use "junk" as a catch-all term for the entire Wii library. That's unfair and rather stupid because there are good games on it, but not many and very few from third-party developers such as Konami, Capcom and Namco (in fact, only two titles, Madworld from Sega and No More Heroes from Grasshopper are the only third-party games worth noting). It's not the developers' fault on this matter. Nintendo created something new, as they always like to do, but this time it wasn't so warmly embraced by the developers. The reason? Because it wasn't warmly embraced by most gamers, just those who like to pick up and play for a few minutes, then move on to the cocktail party in the next room. The developers and gamers have a relationship, and that relationship has been the same for decades. It says "we don't need to re-educate you on how to play, you just sit and play." Is it because the world is too used to the idea of thumb-based control that having them get up out of their seat is ludicrous? Well...yes, yes it is. Its the same reason why 3D movies will never fully takeoff. It's gimmicky and not what people, for decades, have become accustomed and focused their efforts on. I can't say whether that's right or wrong, but sometimes, once things are established (which Nintendo helped establish, I might add) to ask to throw it all aside is difficult. Games have made people passive. It's a passive activity that has you sit back and stare at a screen. Suddenly getting them up and shaking their hips would be like installing treadmills at libraries. It's simply too late to ask so much. So what are we left with? Games that appeal to the notion of short-term gaming. It's pick-up-and-play for the family that anyone can get into. Therefore, the developers create cheap and inexpensive games to cater to this crowd. Now cheap games for a console is nothing new, every single one has them, but most are stuck in a bargain-bin at the local Best Buy, not in the actual gaming aisle and dominating the shelf space. Perhaps it's my high-degree of pessimism and bewildering desire to over-analyze things, but Nintendo has fallen from its graces. The sells are high, astronomical, but in ten years is anyone going to look back and see the Wii as a great console? It's a huge success, but at the same time it's a huge failure. You can't tell Nintendo that, their numbers are making them happy. You can't tell developers, the few the little system has, that either because they spend little to make what are essential low-quality flash games and make a profit with, what most are calling, "shovelware" (cheap games sold cheap). The Wii also gets by, ironically enough, through retro gamers who want to relive the classic titles through Wii's downloadable gaming network and play the old NES, SNES and Genesis titles. If you can't play a new Zelda, I suppose A Link to the Past from 1992 will have to do. For every MadWorld, No More Heroes and Mario Galaxies there's at least five mini-game collection titles or movie/tv show tie-in titles. Even some of the better reviewed games like Trauma Center and WarioWare I would consider below-par efforts that I can play in my web browser. They're all about the Wii controls, though, and it's obvious the developers and the gamers will take what they can to justify their console purchase and show everyone in the room how neat motion-control is. I suppose Nintendo's old motto (or excuse, rather) of "quality over quantity" has become conveniently forgotten. I sort of knew something wasn't right when Nintendo announced the Wii launch lineup. Their biggest game: a port of The Legend of Zelda: Twilight Princess from their previous console. That sent up red flags for me. Of course, Wii Sports was popular (one of the biggest all-time sellers, in fact), but it falls in the same chalk-outlined area of cheaply done titles to get you out of your seat and waggle your stick. It's fun for a few minutes, but in a few years it's not going to set afire the "greatest games of all time" lists, that's for sure. So it's that element that, I suppose, brings up the notion of sales not being equal to the quality of the game. Look at Wii Sports. It's sold insanely, but nobody with any sense can tell me it's actually a great game in the vein of Super Mario Bros 3, Metroid or Metal Gear Solid. When it comes to consoles and game titles, some might say Nintendo dominated with the Nintendo and Super Nintendo, got by with the N64 and regained a some luster with the Gamecube - but what can be said with the Wii? It's been out for years and comparing the library of titles of the Wii to even the N64 shows a similarity between third part developer support, in that there is none, but also a difference in that the little support the Wii has cranks out shovelware. More importantly, though, is the differences between the first party support from Nintendo itself which, for the first time in a long while, is nothing of any particular note. The Wii is heading down a path of great success with the sales, but once the hindsight starts happening in six or seven years, it's going to be seen as underwhelming if not a failure. I'd love Nintendo to prove me wrong, Lord knows their third-party developers probably won't, but that aspect of the "Big N" faded out a long time ago. If you've read any of my articles about Nintendo at this site, you know my history with them and there's a fondness there of their classic consoles and games. I'm not, what internet geek-speak calls, a "fanboy" of anything, a term used to describe die-hard fans of something that often overlook the faults, and maybe it's the fact I don't really get attached to things that allows me to look at it unequivocally. I see the Wii. I see the past Nintendo products. I see the public perception of Nintendo years ago and the perception today. Something is wrong yet nobody realizes it because it sells better than any other console. I think I'm in Bizarro World. Things like DDR & guitar hero are great, because they take a novel idea and run with it. However, I agree that making a console based on that idea, and running with it at the expense of everything else is a bit absurd. I like to lay down and play a game. I find guitar hero fun in limited doses, as do I with DDR. But waving my hands around to play a game isn't my thing, and to make that feature the centerpiece of nearly every game is a bit crazy. There are some ways it can make gaming better, but I agree it's a mistake to shove it down everyone's throats. I sometimes wonder if Nintendo has looked at gamers lately? Let's be honest, they're not exactly the most athletic group of people. They want to sit back with snacks and sodas (or beers) and play. The Wii if best in small dosages, but I don't think videogames need to be "small dosages." Arcades used to flourish on that and they're pretty much dead now. I think that's what Nintendo has tried to recapture but is failing because the quality isn't living up to their vision. The Wii is a home arcade, plain and simple. Gimmicky games galore. It succeeds with its targeted market, not necessarily with the rest of us. That doesn't stop games like Mario Galaxy (infinitely better than that piece of crap Mario Sunshine), Twilight Princess (which was delayed so much, it never should have been released on the GCN at all), and Okami (a port from the PS2, but if you play it, you'd have to agree that it rightfully belongs on the Wii) from rocking my socks off. I have never stood up to play any of those games. My living room is too small for that. I gave up on Wii Sports after I got a real game. I hate the casual gaming movement and ultra-main-streaming of the hobby as much as the next guy, but I can't fault Nintendo for having a financially successful system. They didn't do it with DVD-playing capability, they did with cheap and accessible gaming. But then I hate the X-Box / 360 and all it /they stand(s) for. It, too, panders to the casual gamer in the form of endless FPS games and online deathmatches ad nauseum. Which is worse? I daren't say. The Wii has some solid titles, Bond, and the downloadable content nice, but overall, I think the variety and quality is questionable. Even if it wasn't a stand-up-and-play focus (although that's what Nintendo wants) the games are nothing to write home about. In a decade, people going to look back and see it as this weird black sheep: no games of significance and a console that pales in comparison to even the N64 and Gamecube. When the strongest part of your library is downloadable retro tittles, you have problems. I wish more game consoles were cheap and accessible, but they need to have the games to back it up. The odd controls and archaic capabilities on the system itself limits it on what developers need to do and what gamers want to do. I'll give you that. As a whole, the system is flawed in its massive massive library or mediocre and gimmicky games. However, the same can also be said for the Virtual Boy. Nintendo has always pushed the envelope and made gimmicky-yet-revolutionary innovations in gaming. In terms of quality titles, the Wii is indeed a total failure. It has the diamonds in the rough that I mentioned, but most of the games are sub par. As a console, though, it has made its mark. No one may be able to recall the names of the games they played, but I feel like a certain sort of nostalgia will grow for the Wii itself, as a whole. This philosophy will fail me, however, if the Wii gets sequeled and this is seen as the entire future of Nintendo's gaming universe. If the next Nintendo console is simply an updated Wii, much like the PSX-PS2-PS3 is simply an upgrade in power, then I will get angry and begin decrying the gimmick. I certainly will not purchase another system to play a copy of Mario Galaxy. But I will buy Mario Galaxy 2 or the next Zelda title if they happen to come out for the Wii. I was reading an article on Gamasutra about 6 months ago that was essentially making the same point you are, Conrady, but in different words. The point was that the reason the Wii will be forgotten in the future is that Nintendo's success has not been good for anyone except Nintendo. It hasn't helped the game industry as a whole. None of the other console manufacturers and publishers are seeing their numbers go up because of Nintendo. That, more than anything else, makes me look at the Wii as a fad. If you go up to an average 18 year old girl and ask if she wants to go play a PS3 or an Xbox, I'll bet you anything she'll just roll her eyes and possibly even make a comment about you being a nerd. Ask her if she wants to play a Wii, however, and the response changes to "OMG can we play tennis?!?" The reason for this is that video games, despite Nintendo's success at penetrating the non-gamer crowd, are still nerdy. Every once in a while, though, something comes along that breaks through that barrier. Tomagachis and GigaPets are examples of this; they broke through the barrier of being a "video-game," were insanely popular for a year or so, and then forgotten. I think the Wii, though it will last a bit longer, can ultimately expect the same fate. The novelty will wear off on all those "casual gamers," and Nintendo won't have anyone else to fall back on. What's unfortunate is that I don't think it needed to be a fad. Nintendo could have pushed the technology harder but decided not to. If Nintendo isn't even going to push it, then why should third party developers feel obligated to? Even Nintendo is a bit lacking in their releases for the system when they should have been setting the standards like they did with the N64 and Gamecube.